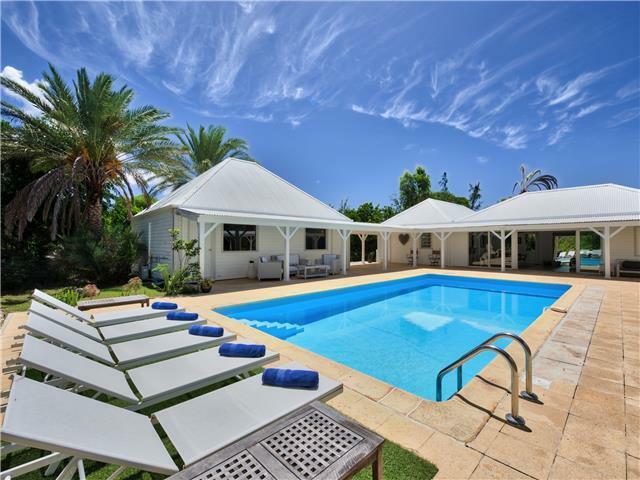 This gorgeous property is a mini paradise of luxury and relaxation. This home has such an airy and dreamy feel about it with its complete white walls and high, white wooden beam ceilings. Two of the bedrooms are decorated with modern, funky art and chair seating and the third bedroom has a mini living area complete with white wicker chairs and a sofa. All of the rooms lead out onto the deck area where you can take advantage of the pool. The house has an U-shape design with the pool as the centerpiece out back and a large, covered deck area all the way around.Though this property is quiet, secluded and surrounded by palm and local island flora, you are still close enough to visit the other beautiful beaches that Terres Basses offers. So come and enjoy some peace and tranquility at Greystone. At Key Caribe we pride ourselves on your satisfaction and you can be rest assured knowing that our accommodations are suitable for a range of people. Our properties are all close to the beach and local tourist's amenities such as bars, restaurants, cultural activities and much more.